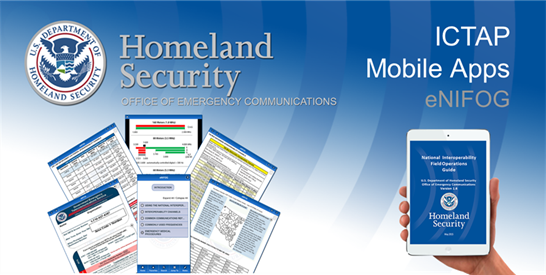 The National Interoperable Field Operations Guide (NIFOG) is now available as the eNIFOG mobile app on Apple® iOS™ and will be available soon for Google® Android™ devices. The NIFOG is a technical reference for emergency communications planning and for technicians responsible for radios that will be used in disaster response. It includes rules and regulations for use of nationwide and other interoperability channels, tables of frequencies and standard channel names, and other reference material. Easy to Use. The eNIFOG app gives users easy access to NIFOG information, offering a content index with shortcuts to reference sections, tables, figures, or images. Navigation links allow users to jump directly to regional quick references as well as bookmark Favorites to develop their own personalized access to critical information for their territory. eNIFOG can be downloaded and then taken to the field as an offline reference, to be used without the need of a cellular or data connection. Get the App. On your mobile device, search for “eNIFOG” on Apple’s App Store (iPhone or iPad) or Google Play (Android) to download the apps. Questions? E-mail John Peterson at john.peterson@hq.dhs.gov to get more information, request help, or offer feedback.